Looking For The Best Dating Service In Your Area? Here’s a lesson from Garry Trudeau in Doonesbury. From the Law Of Attraction we know that our thoughts create our experiences. So how do we control our thinking? Thinking’s a bit like breathing. Clearly we can control how we breathe if we want to, but most of the time breathing is just something our bodies do automatically. As an exercise – think of a red rose. As Garry Trudeau suggests, controlling our thoughts is just as possible as it is to control our breathing. we can control our lives. Easy – right? Wrong. Because just like breathing, most of our thinking is automatic. It’s a function of a lifetime of experiences – positive and negative – learned habits and prejudices. Our brains (synapses) are literally hardwired to certain patterns of thought. That’s the bad news. 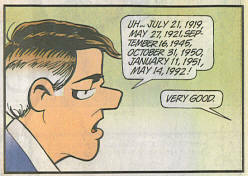 Firstly – as in Doonesbury below, it is possible to control those thoughts even if initially it’s only for short periods. Secondly, it is possible over time to re-wire those synapses and make your automatic thinking more in line with creating what you want. This is the work we have to undertake. Once we master this, then we have in our hands the levers to order our lives and create whatever we can conceive.